The bracket in the picture builts 108 mm out from the wall, which gives a good access to clean the space behind the radiator. All parts of the bracket are galvanized and powder-coated, so that they also can resist effect of water. 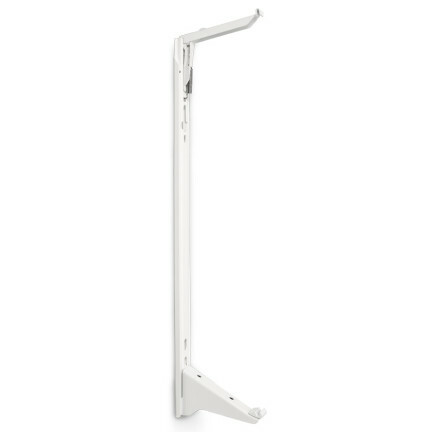 The hospital bracket kan be adapted to most radiator brands, and to all heights from 300-900 mm. The bracket top part is made from galvanised sheet steel 1.25 mm in combination with fibreglass reinforced plastic. The bracket rail and the foot part are made from galvanised sheet steel 1.5 mm, and powder coated. There is a plastic inlay in the bracket foot. The brackets are packed loose in boxes or in pairs in shrink film, with or without accessories. All packing material is recyclable. The product can be labeled according to our customers requirements. All brackets are tested in accordance with the new German recommended standards VDI 6036. Load capacity tables for different radiator sizes can be provided by Sigarth. MONCLAC wall brackets are always made to measure and customer requirements, which also secures the function of the product. Please contact us for drawings and offers to your specific radiator brand.